Editor's Note: We're rolling out 10 Days of Indie Merchant Gifts, in our annual celebration of the artists, craftspeople, designers and other independent merchants who make one-of-a-kind products. See gifts in the categories of pets, jewelry, kids, quirky, food, eco-friendly, beauty, practical and apparel. The holidays are meant for sports. Think college-football bowl games and sledding. Skating on your town's ice rink. 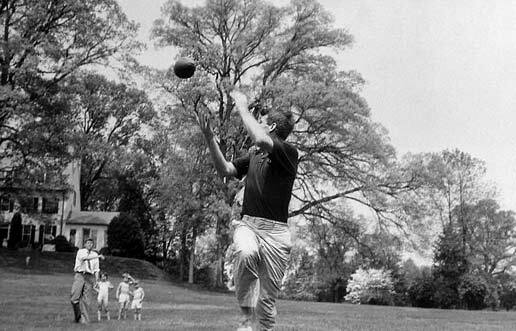 Playing touch football in the backyard, Kennedy-style. So what's more perfect than an athletic-themed stocking stuffer? Here are 5 entries that we selected as the best gifts for sports lovers this holiday season. See our accompanying slideshow to hear about the stories behind the products, and why we chose them. In his submission, Bill Cowles of Brooklyn, N.Y., says he and fellow designer William DiMotta "discovered an interesting aerodynamic property in a scrap piece of cardstock and set out to understand the physics and dynamics in a larger scale for outdoor play." That led them to develop the Hela disc, a new take on the classic Frisbee. After creating hundreds of prototypes, they settled on this ellipse-shaped ring, which is "engineered with new properties of extreme lightness, accuracy, distance and ease of use," Cowles says. Editors' comment: This is a "high-tech" update to an old favorite. An editor who tried the Hela on a windy weekend reported that the disc performed admirably, and his girlfriend "who can barely catch or throw a regular Frisbee" was able to use it with ease. To note: It's made with hard, thin material, so some might want to wear gloves to protect their hands. Heather Messal, a runner in Venice Beach, Calif., says she created this "no-bounce" detachable sport pocket because she was frustrated with what was available on the market for running pouches. "I bought wrist and shoe pockets (too small), vests with pockets (they flopped and flew around no matter how small I tightened them) and of course, waist packs which chafed, twisted and flopped no matter how loose or tight I made them," she says. Her creation SpiderBelt stays in place, she says, and when you fill the pocket with keys, iPod or money, it doesn’t flop or bounce. "I've run four marathons wearing a SpiderBelt and I never workout without it," she says. Editors' comment: Clever. We tested the SpiderBelt's no-bounce usefulness, and approve. Product: "The Outdoorsman's Fastening System"
A few summers ago, Jeff D. Dahl of Medford, Ore., was at the waste-disposal station and "struggling to untie a rat’s nest of knots" in the rope that was holding down his tarp. "Being a guy who's not good at tying knots in the first place, it occurred to me just how useful a rope would be with hitch knots in it whereby I could zip-tie them together to create the tensions I needed to hold stuff in place," he says. A few trips to the hardware store and much prototyping later, he came up with the LoopRope, the "duct tape of bungee cords," he says. Editors' comment: This seems useful for all sorts of sports -- be it hunting, fishing or canoeing -- and beyond. And we liked that Dahl's frustration sparked innovation. The team at Loon Outdoors in Ashland, Ore., says this "Nip n' Sip" is a "little stainless steel package of ingenuity." The device has stainless-steel cutting jaws, extra wide grated pads for grip, an eye-clearing needle, a ball chain for a key chain or vest attachment, and, of course, a built-in bottle opener. It is designed to give an angler a "no-nonsense" way to cut a line or leader, while also serving as reminder to "let loose" and enjoy the process. "Business in the front, party in the back," the team writes. "Sorry, Chuck Norris, but we're not talking about mullets." Editors' comment: We liked how this combines function and fun. It's many tools fused into one. Easy to use, difficult to lose. The team at Khataland in Millstone Township, N.J., has designed the "YoFoMat," a yoga mat with a foldable design that makes it only a book size. The YoFoMat fits into a small backpack or carry-on luggage so you can "be a yogi anywhere," the company says. It's also eco-friendly, and doubles as a meditation or sitting mat. Editors' comment: Handy for the person who wants to practice yoga anywhere, anytime.